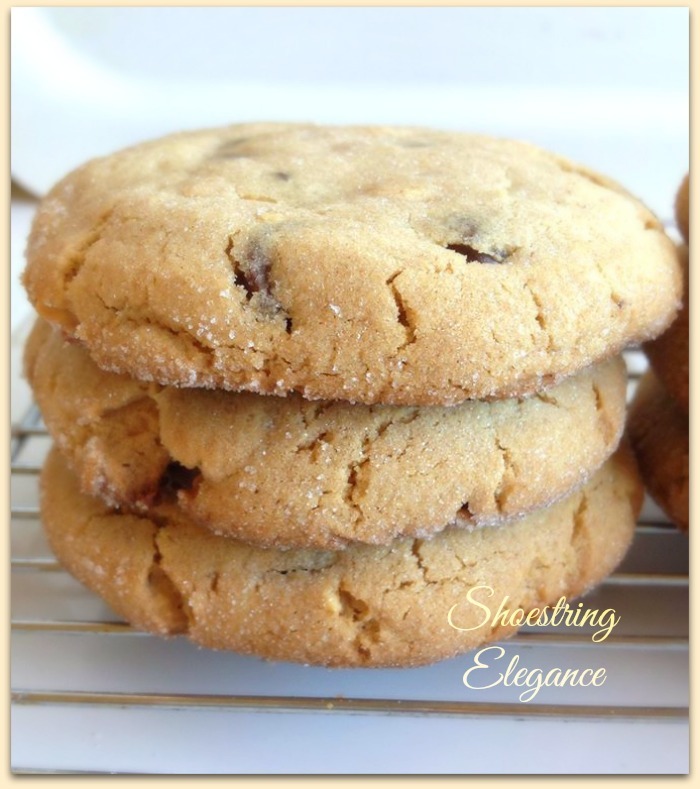 Shoestring Elegance: Dipped Peanut Butter Chocolate Chip Cookies "Peanut Butter Bash"
Dipped Peanut Butter Chocolate Chip Cookies "Peanut Butter Bash"
Good Morning! I was recently asked if I was interested in joining a cooking challenge group. 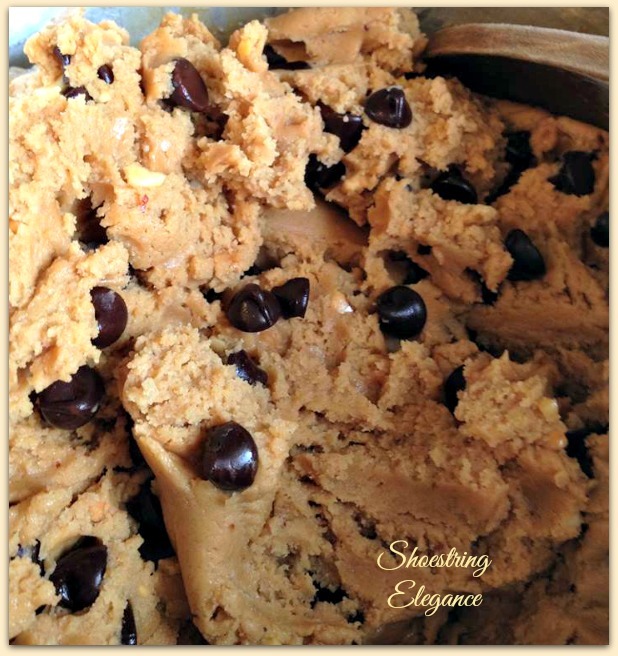 The challenge was, to join a Peanut Butter plus an additional ingredient recipe link up event. I love to cook and enjoy a good challenge, so I thought, why not? This, now, from this point forward, will be called "The Peanut Butter Bash". I get to ink up with some other awesome Blogging ladies and cook and share what we made. Kind of exciting! So, here is the hitch: the additional ingredient! This month, I must say, was fun for me, because I picked "CHOCOLATE" to be the additional ingredient for the month. We are going to be doing this on a monthly basis. Every month, on the first Thursday, Peanut Butter and another ingredient. Wish me luck , My Friends. Each of us wrote a normal Blog post, sharing a recipe with you! The difference this time was to all agree on a theme, and we did! 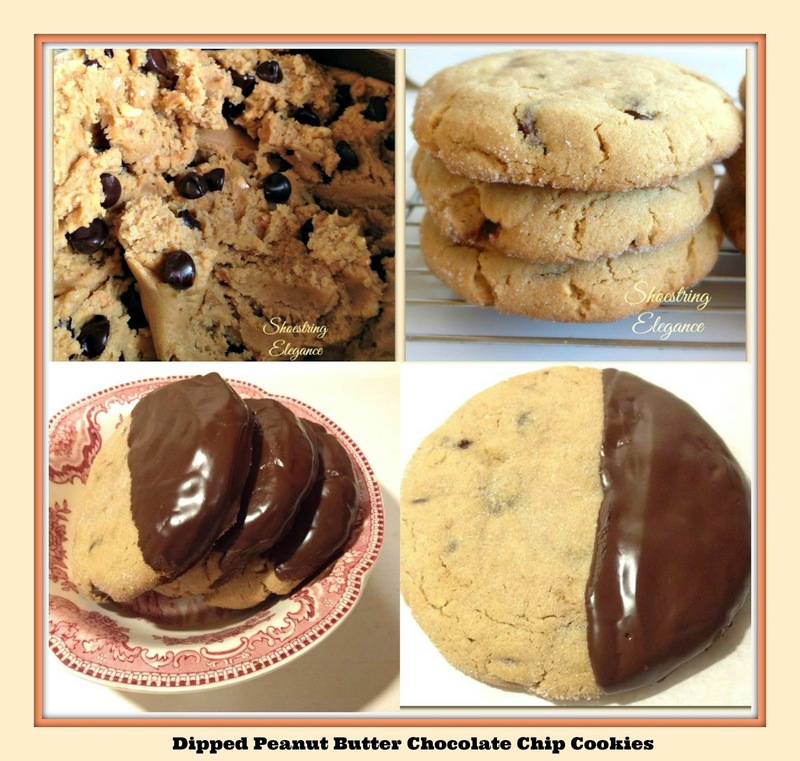 I think you will Love to know that all of our recipes include Peanut Butter and Chocolate! Yumm! I have worked on and fine tuned a recipe that I think you will really enjoy. I like it. My family & friends enjoy it, too. I hope that you will enjoy it, too! 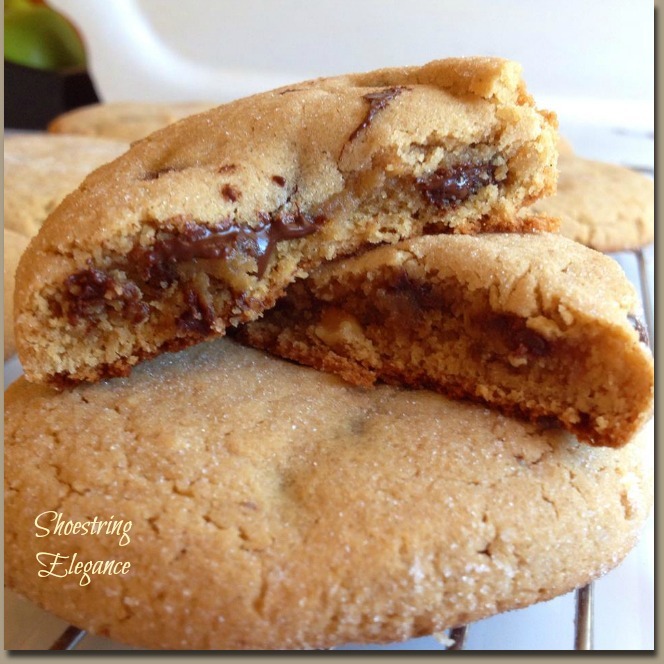 I make these Soft Peanut Butter Chocolate Chip Cookies several times every year, it has become a Family favorite for us. I don't really remember how I got it to this recipe, other than to say, I probably started at some point with a recipe that I wasn't completely happy with and just change amounts and removed and added some ingredients until I came up with this. I hope you enjoy them! Blend on Medium for about 90 seconds, scraping your bowl a couple of times. 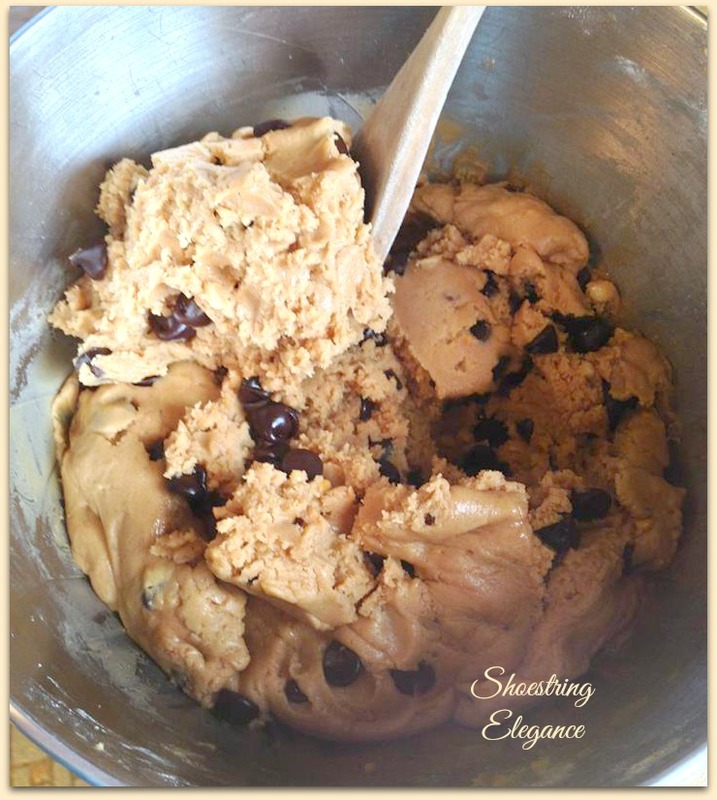 With your mixer on low, add 1/2 cup of your dry ingredients, until well incorporated. Save the last 1/4 to 1/2 cup flour mixture to add 1-2 cups of chocolate chips (depending on your personal preference) I use a cup and a half in mine. Especially, these ones, because I am going to dip one side in Melted Chocolate. Yep that's what I said, even...more...Chocolate! When your batter is complete it resemble the picture to the left. Cover it with Saran wrap and place in the fridge for 30-45 minutes. Once they've chilled, roll approximately 2-3 teaspoons of batter into ball and then roll in granulated sugar. 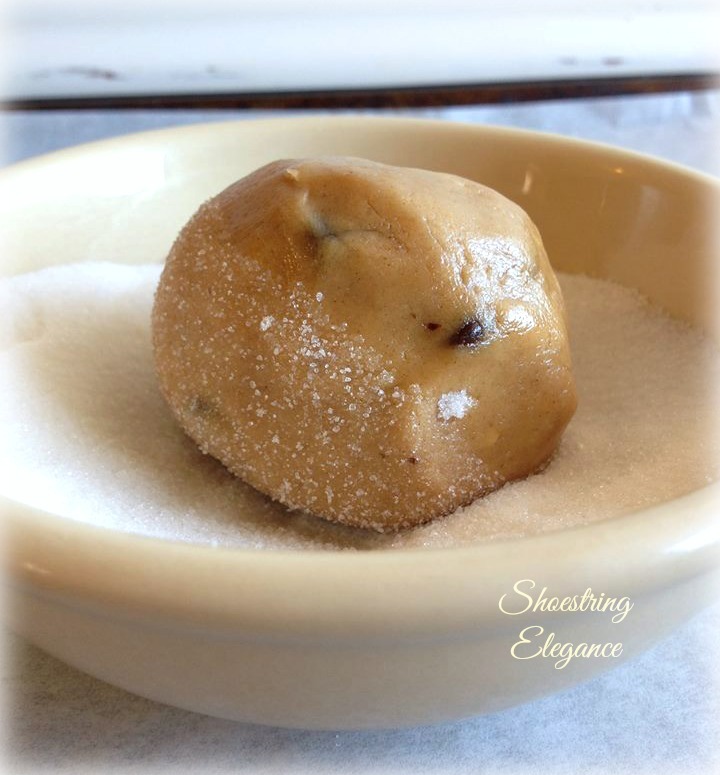 ( Don't you love that little picture of the ball of dough in the sugar? I don't know why, but it just makes me smile) Back to the recipe. I like to bake them on a parchment paper lined cookie sheet @ 350-360 degrees F.
The end result should look something like this! This is much more easy than most people think. But, it certainly will give them that wow factor if you are taking them somewhere or serving them for dessert. 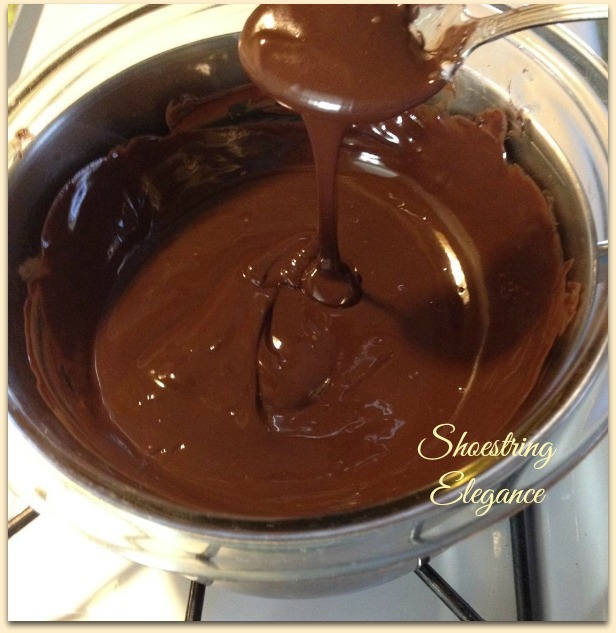 Melt 1 cup chocolate chips and 1 teaspoon Crisco or other non-tasting oil, in a pyrex bowl over a low heated pot of water. Make sure you stir right away, because it really only takes a minute or two. So, after all your hard work, I hope you will be quite pleased to have something like this to show from your Labors! I know I always am. Just make sure you have plenty of people around to help you eat them or you could get yourself in big trouble! So, that's it for me! I hope you enjoy this recipe and will give them a try! But, If they are not your cup of tea, you may want to pop over to one of the other ladies entries. Thank you so much for spending time with me here today. I Hope you are having a wonderful week and looking forward to a great weekend! Do you want to join in the Peanut Butter Bash fun? If so, email Miranda at miranda@cookiedoughandovenmitt.com and request to join the Peanut Butter Bash facebook group! The first Thursday of each month we post a dessert with peanut butter and a mystery ingredient. This month’s ingredients were peanut butter and chocolate. Lots of fun and lots of calories! Here are the other peanut butter and chocolate creations! This Recipe was Featured By the Incredibly talented Gator Mommy, here! Thank you, Linda! you, too! My family can never get enough of cookies. I love how you dipped these in more chocolate. I could sit down and eat a good dozen of these! Great job Theresa! Good Afternoon Theresa, Oh I really love chocolate and peanut butter is a real favourite of mine. So to see the two combined, well, I am in heaven. That is what I love about cooking, starting with a basic recipe and then tweaking it to suit ourselves. I shall certainly be trying your recipe.